Did you write that stuff on a typewriter? Lucy McGough wrote: Did you write that stuff on a typewriter? Of course. 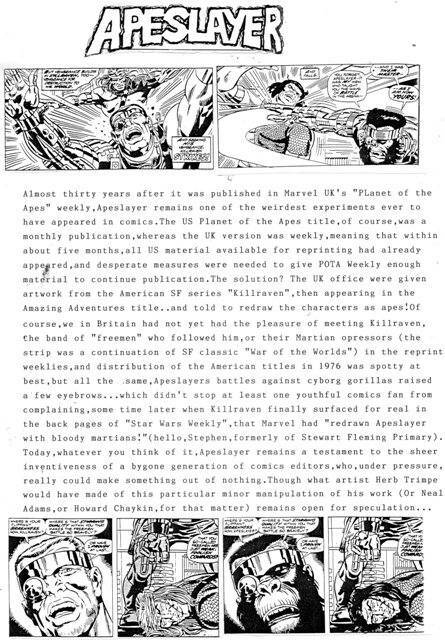 It was an old fashioned cut'n paste fanzine. That's how they used to be made. Lucy McGough wrote: Kewl. That's well retro. It wasn't in the 1990s. Lucy McGough wrote: Typewriters? They totally were. Probably not. Sure, computers were becoming more available, but (especially in the early 90's) typewriters were around and standard for a long while. More in some places than others, but until the early 2000's, at least in the US, computers weren't readily accepted as necessary. It was the same here. Typewriters didn't really start to disappear until about ten years ago. Don't forget that, in-between, there were "word processors", the sort of computerized typewriters. I never had one of those! Oi! I threw something away. Once. MajorHoy wrote: Don't forget that, in-between, there were "word processors", the sort of computerized typewriters. Oh, that is beautiful! I thoroughly approve! tony ingram wrote: Oh, that is beautiful! I thoroughly approve! I want one, I think. If they work as they're supposed to, it's a great idea. General purpose laptops are great, but distracting. This could solve that. I know, it's almost impossible to manage your time properly when you the have the distraction of immediate internet access. I still have one! Can't get ribbons for it, though. These days it's purely decorative. tony ingram wrote: I still have one! Can't get ribbons for it, though. These days it's purely decorative. I had one my grandmother gave me, kept it for years and finally got rid of it exactly because I couldn't get ribbons for it. Was unhappy about that. What would you blokes refer to as "garage sales" / "yard sales" / "tag sales" over there? Or a car boot sale. Thanks! I've just dragged my old Brother typrewriter out of the loft and tried it out, and it still works! I think it's been up there for about eight years! tony ingram wrote: Thanks! I've just dragged my old Brother typrewriter out of the loft and tried it out, and it still works! I think it's been up there for about eight years! I'm certain I was still using it in 2006. I think I was still producing an old fashioned cut and paste fanzine at that point. I want a go on your typewriter! Lucy McGough wrote: I want a go on your typewriter! You may have one, any time you like.